The year 2016 marks the 400th anniversary of the death of William Shakespeare, considered by most to be the greatest playwright in the English language. To commemorate the event, people around the world are celebrating his life and legacy through performances, exhibitions and festivals. Tippet Rise is celebrating too, thanks in part to our partnerships with two extraordinary organizations that work to share the Bard’s legacy far and wide. 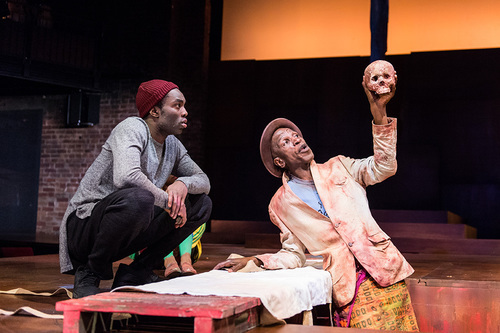 Summer and Fall of 2016 at the art center saw screenings of Hamlet, Cymbeline and King Lear from Britain’s Royal Shakespeare Company (RSC). Performed and recorded in Shakespeare’s birthplace, Stratford-upon-Avon, just weeks before arriving at Tippet Rise, the films provided our audiences with the chance to see extraordinary theater from one of the world’s greatest Shakespeare companies. One of Shakespeare’s lesser-known works, Cymbeline takes place in ancient Britain. Yet its themes, which include questions of national identity and sovereignty, are as relevant today as they were when Shakespeare first penned them. With three theaters in Stratford-upon-Avon, the Royal Shakespeare Company reaches audiences around the world through live broadcasts and screenings, touring, and an impressive website. Not only has the company received countless accolades and honors, it is the only theater company with its own in-house armory where breastplates, gauntlets, belts and weaponry are custom-made and fitted. How fortunate we are to have access to the company’s productions here in rural Montana. On a sunny day in early November, high school students from the nearby community of Red Lodge traveled to Tippet Rise to participate in a Shakespearean stage-combat workshop and to watch that evening’s screening of King Lear. 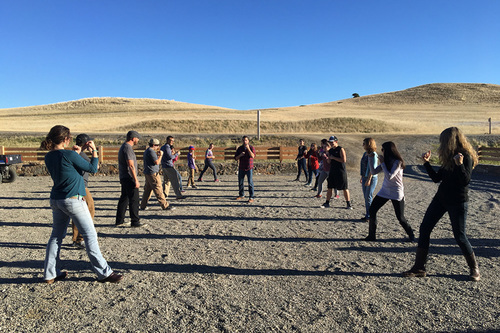 Taught by Kevin Asselin, Executive Artistic Director for Montana’s beloved Shakespeare in the Parks theater company, the workshop helped students, teachers, even Tippet Rise staff learn stage-combat moves and, by the workshop’s conclusion, combine them to create a basic fight scene. In December we enjoyed two live performances of Hamlet by Montana Shakespeare in the Schools, a project of Shakespeare in the Parks. Directed by William Brown, from Chicago, the 75-minute production featured an eight-member professional cast. The company’s creative staging and costuming combined with the actors’ wonderful performances kept both audiences engaged and, quite often, poised on the edges of their seats. Montana Shakespeare in the Parks has performed throughout our region since 1973. Since the company’s inception, its summer touring program has presented over 2,150 performances to nearly three-quarters of a million people in Montana, Wyoming, Idaho, North Dakota and Washington. We at Tippet Rise are grateful to be able to share the legacy of the Bard through the fantastic work of Montana Shakespeare in the Parks and the Royal Shakespeare Theater Company.